Ten Speed Press, 9781607747796, 176pp. A history of one of the world's most iconic cocktails--originally an Italian aperitivo, but now a staple of craft bar programs everywhere--with 60 recipes for variations and contemporary updates. The Negroni is one of the simplest and most elegant drink formulas around: combine one part gin, one part sweet vermouth, and one part Campari, then stir and serve over ice. This bitter, sweet, and smooth drink has inspired countless variations as well as legions of diehard aficionados. In The Negroni, Gary Regan--barman extraordinaire and author of the iconic book The Joy of Mixology--delves into the drink's fun, fascinating history (its origin story is still debated, with battling Italian noblemen laying claim) and provides techniques for modern updates (barrel aging and carbonation among them). Sixty delightfully varied and uniformly tasty recipes round out this spirited collection, which is a must-have for any true cocktail enthusiast. GARY REGAN writes The Cocktailian, a biweekly column for the San Francisco Chronicle. His work has been featured in magazines such as Food Arts, Food & Wine, Wine & Spirits, and Imbibe, among others. He is the author of The Bartender's Bible, The Book of Bourbon and Other Fine American Whiskey, The Bourbon Companion, New Classic Cocktails, The Martini Companion, and The Joy of Mixology. "Gary Regan, an expert on drinks, explores the cocktail with recipes, classic and new, and shows how easy it is to experiment." "It's hard to imagine a 150-page book devoted to a single cocktail -- until you realize how many stories there are to tell about the Negroni. . . Regan is just the man to tell these stories." 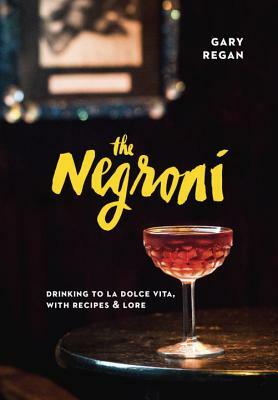 "A former bartender and prolific author, Regan has uncovered a wealth of lore surrounding the Negroni, and has assempled a collection of historical recipes that explore the identity of the drink through its many permutations."